By Ron Miller — Sometimes the line separating "asteroid" from "comet" is a blurry one. For instance, there is the strange asteroid Chiron. Discovered in 1979 by astronomer Charles T. Kowal, it was cataloged as asteroid number 2060. But almost immediately, it was recognized as being a little weird. First, because its orbit turned out to lie between Uranus and Saturn...much further from the sun than any other asteroid. It also had the strange habit of seeming to change its brightness. In 1988, astronomers William Hartmann, Dave Tholen and Dale Cruikshank noticed that Chiron was nearly twice as bright as it was supposed to be. The asteroid continued to brighten, eventually becoming three times brighter than usual. What was going on? The answer was that Chiron contains a lot of ice and as its orbit carried it closer to the sun, some of this ice turned to gas. A huge cloud of gas and dust was forming around the asteroid. In effect, Chiron had turned into a comet. It was discovered by the Lincoln Near Earth Asteroid Research (LINEAR). This is an MIT project jointly funded by the United States Air Force and NASA. 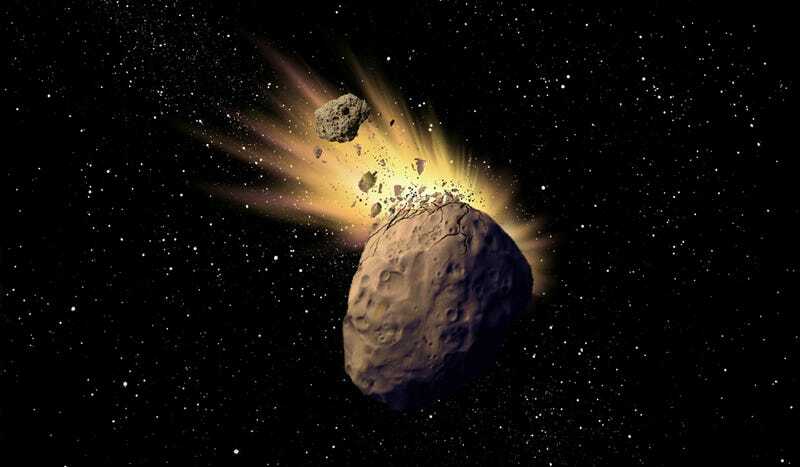 One of its goals is to detect and catalog near-earth asteroids that might potentially threaten the Earth. P/2010 A gives scientists a glimpse into the early history of our solar system, when similar collisions between planetesimals eventually created the planets we know today—-including our own earth.